Day 1, MADRID � ZARAGOZA � LOURDES. Early morning you will meet with the rest of pilgrims at the meeting point, and soon you will drive towards Zaragoza , capital of the region of Aragon. Here, the Virgin Mary (although still alive in Palestine) appeared for the first time to the apostle James (Santiago) who was relentless in his efforts to convert Spain and its people to Christianity. By direct desire of the Virgin, a basilica was built that has come to be one of the most important cult sites of Catholicism . According to tradition, the Virgin brought a marble pillar and instructed James to construct a temple in her honor around it. Thus was constructed the first Christian temple of worship. After visiting the Basilica of El Pilar, we will continue towards Lourdes. After a drive of almost 4 hours with some interesting stops in the Spanish and French Pyrenees area, with beautiful mountain scenarios, will take us, running parallel to the imposing Pyrenees Mountains to Lourdes. During the early evening, you should be in the city of Lourdes. As opposed to the Fatima Sanctuary that was constructed in a deserted enclave, Lourdes is a city replete with history, to the point that figures as important as Charlemagne are associate with its illustrious past . After you have checked into the hotel selected, you will have the rest of the day to explore this pleasant French city, that has so touched the hearts of Christians from around the world. After you have checked into the hotel selected. Dinner and overnight stay. Day 2, LOURDES. 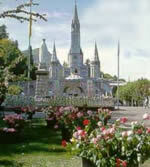 During your stay in LOURDES you will have a chance to walk in the footsteps of ST. BERNADETTE. See the Boly Mill where St. Bernadette was born, view the �Cachot� an abandoned prison where Bernadette's impoverished family lived in humility. Join your prayers with pilgrims from around the world as you pray for the sick, drink water from the miraculous spring the Virgin directed Bernadette to locate at the base of the grotto which has flowed uninterrupted since 1858. Submerge yourself at the Baths which claim thousands of healings . Experience Christ's love as you walk the life-size Stations of the Cross overlooking the holy Grotto. Kneel in the chapel built on the very rock of the Grotto, in obedience to the request of the �Immaculate Conception.� Attend the blessing of the sick, and participate in nightly candlelight processions requested by Our Lady . Dinner and overnight. Day 3, LOURDES, LOYOLA & BURGOS. After breakfast this morning we travel west to the lovely village of LOYOLA in Spain, the birthplace of ST. IGNATIUS OF LOYOLA , the founder of the Society of Jesus, the Jesuits. Visit the Sanctuary where a magnificent Basilica adjoins a 13th century Tower House where ST. IGNATIUS was born. It was in Loyola that Our Lady appeared to St. Ignatius with the Christ Child and his profound conversion began. Later in his life, St. Ignatius renounced his portion of his family's wealth, and wrote the famous book of spiritual exercises. On to Burgos, a medieval gem noted as the birthplace of the 11th century knight, El Cid, and an important pilgrimage stop on the Way of St. James . Visit Spain's third largest cathedral, a showcase of European Gothic sculpture. Dinner and overnight stay in Burgos. Day 4, BURGOS, LEON & SANTIAGO DE COMPOSTELA. After Burgos, you will depart following the Camino de Santiago pilgrimage route towards the city of Leon. Upon arrival you will have a tour of the Cathedral of Leon and once the tour is finished, you will have some time for lunch on your own before you will continue on route towards Santiago de Compostela, following the French route to Santiago. We will continue on our way, leaving Castilian territory via the Galician province of Lugo. Arrival at Santiago de Compostela. Dinner and overnight stay in Santiago de Compostela. Day 5, SANTIAGO DE COMPOSTELA. Breakfast. First thing in the morning, a local guide will meet you in the lobby of your hotel to take you on a tour of the city. You will be taken around the most emblematic sites before visiting the most impressive and important of all, the Cathedral, a masterpiece of Romanesque art, constructed around the sepulchral of the Apostle Santiago (James) . No matter what time of the year you visit the city, you will encounter a multitude of pilgrims who have come, many on foot, to pay homage at his tomb. And so it has been for over a thousand years. Of all the pilgrimages of the Middle Ages, that of Santiago is the only one that continues to be largely undertaken on foot. And, while there are some who undertake the Way to Santiago for non-religious reasons, the majority do so as an expression of their deep devotion. They walk the same paths, contemplate the same countryside, and mouth the same orations in the same places, as did the first pilgrims over ten centuries ago. Today, the imposing granite presence of the Cathedral dominates the city, physically, socially and economically. In the evening, you can sit in a café terrace or stroll about the city's streets, animated by a large student presence as Santiago is also home to one of Spain´s oldest universities. Overnight stay. Day 6, SANTIAGO COMPOSTELA, WAY SAINT JAMES & SALAMANCA . After breakfast depart Santiago along the Way of St. James towards Ponferrada where we will connect with the old Roman Silver Route towards the university city of Salamanca, a true marvel of renaissance art. The University is among the three most ancient in Europe (founded in 1218) and has had among its students and professors Brother Luis of Leon and Saint John of the Cross. In addition, the city is one of the few European cities with two cathedrals, one ancient in the Romanesque style, and the other in late gothic style. 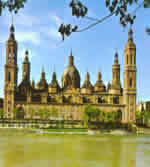 We will enjoy this afternoon a walking tour of Salamanca before dinner and overnight. Day 7, SALAMANCA & FATIMA. After breakfast, we will leave Salamanca towards the borderline city of Portalegre, and soon we will arrive into Portugal. We will continue towards our main destination Fatima, where we will arrive early afternoon. Check in at the hotel and rest of the afternoon we will be able to attend some of the local pilgrimage masses before dinner and the candlelight after our dinner at the hotel. Overnight stay in Fatima. Day 8, FATIMA. After breakfast you will celebrate mass at the Chapel of Apparitions with other pilgrims. 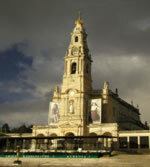 After Mass you will tour Fatima, where the Blessed Mother appeared in 1917 to three shepherd children (two of these children were Beatified in May 2000). See their houses in the village of Aljustrel, the parochial church of Fatima where they were baptized, and of course, the chapel erected on the site of the Virgin Mary's appearances and the basilica. It is not surprising that Fatima is one of the most visited Christian pilgrimage destinations of the world. Dinner at hotel. Join other pilgrims gathering at the Shrine for a candlelight procession. Day 9, FATIMA & MADRID . After breakfast we will depart towards Madrid. We will stop along the route for lunch on your own before arrive into Madrid in the afternoon. End of services.